Ready your wallets, my friends. 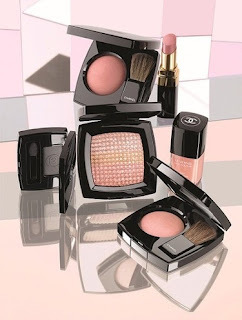 The new Aquillaries de Chanel Collection is sure to capture your imagination. 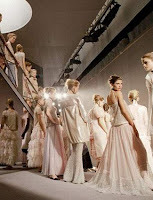 The collection will ship to select Neiman Marcus stores this month. Inspired by th e looks of Chanel's Spring/Summer 2011 Haute Couture Show, Peter Philips created several new, limited-edition pieces and reached back into Chanel's beautiful line for others. The new, exclusive pieces have taken their place on my must-have list. Here's the pretty-in-pink lineup in Aquillaries de Chanel. Ombres Tissées in Beiges is a pink-peach highlighter that was created for the show. It will jump into my bag the moment it arrives at the store. I'll also be looking for Royallieu and Gris Exquis. It will be a happy day! Thank goodness this looks too light for my complexion! You can bail me out of debtor's prison? Ava, I second that! My wallet is hurting! OMG. have been waiting for that pearl highlighter since October last year!! Would someone pul-leeze hand Lovethescents a tissue? LOL And bring me one while you're at it! I have been surreptitiously mopping up the drool ever since seeing this collection several months ago when back stage pictures emerged. These kinds of muted pinks, beiges, and grays really speak to me of autumn's shifting light as it fades into the hazy shades of winter. I've already purchased Royallieu and have been counting the days waiting for Gris Equis and Ombres Tissées in Beiges. Fauve is also on my must try list as is Armani's Rose Piqué de Mauve. I can easily see the direction my autumn is headed. I have already called to see if I can pre-order it, but the stores I have called do not know anything about it! Do you know who or where to contact? Ooh, I wonder how close Pink Cloud JC is going to be to Narcisse JC. Speaking of Narcisse, I would really, really love it if Chanel would repromote Turbulent JC. Ah, that would be the day. You can pre-order from Kathy Shoreman at Neiman Marcus by calling 703-761-1600 and asking for her in the beauty department. I believe her extension is 3282, but that's from memory. If you ask for the Jo Malone or Armani counter, they will find Kathy. Isn't it fun when old favorites return from the grave? I'd love to get my hands on "those archives." Brerib, I just found out Kathy isn't working today. Give her a call tomorrow. Peter Philips never stops creating!!!! "your" collection is not the same as ours, no aquillaries here, just "les fleurs d'été" which you had in Spring, if I remember correctly...Never mind, we are waiting patiently for the Autumn one at mid-August( my wallet is smiling:-) Enjoy your beautiful Aquillaries everyone! The highlighter is a must have! Still debating whether Royallieu is too similar to Boy - but those fashion show photos are so tempting :) You don't think it will be NM exclusive? I'm in need of several items in this collection. IN NEED!!! Sadly, the only NM in Atlanta is about 45 minutes from me, so I never get down there...I literally have to drive past 2 other malls to get there. But oh, the temptation!! Pink! I die!! If I don't pick up the highlighter I will go crazy!! LOL. Hope you don't have to wait until November for these lovely treats! To everyone I missed today, I hope you enjoyed the photos as much as I did. I'll show you more soon! Cafe Makeup has a nice comparison shot of Royallieux and Boy. Boy is actually quite a bit darker. Royallieux is a much lighter and milkier pale pink that might actually be too light for a lot of women. It gives a glossy, barely there lips that combines beautifully with soft and smoky come hither eyes. Will this collection be available online? Just a guess, Anonymous, yes, probably at Chanel. Not all NM stores will have it, though. Hi Divasquire...you and me both! I just don't think I can give up food, so I'm not sure where to cut back. Beautiful collection! Do you know how soon it will be available for purchase? Is it available in the US and online at chanel.com? The collection is shipping to Neiman Marcus "fashion doors" on Monday. Give it a week. I would imagine it will be available at Chanel.com - but can't say for sure. This one has me asking every day...Did it come? We kind of expected it Friday, but now we are looking at Monday. Can't wait!